Beast, the self-described "four-nippled rock and roll aberration" released their debut album, Smoke Swig Swear today. I've been looking forward to this baby since the band's electrifying set at Oppikoppi last year. For all you naysayers that said two basses is a simply crazy idea, this should prove you wrong. 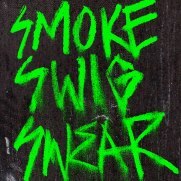 Download Smoke Swig Swear over here.